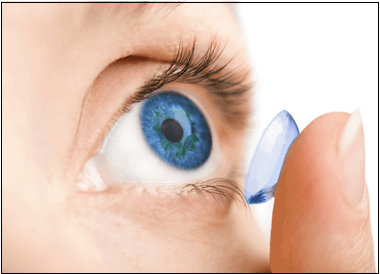 It is common knowledge that long term contact lens wear can not only cause an intolerance to lenses which can lead to painful, red, dry and itchy eyes but also increases the risk of developing an infection. In a recent study by the Centres for Disease Control and Prevention (CDC) (click to read article) found that contact lens wearers take risks with their eyes on a regular basis. The report found that 99% contact lens wearers in the US were putting the health of their eyes at risk, with 82% wearing their contact lenses for longer than recommended and half of the people surveyed admitted to having slept in their lenses. Health experts believe that these behaviours can raise the risk of eye infections by five times and those that shower or swim with contact lenses are even at risk of going blind due to a parasite (Acanthamoeba) found in water. Smokers were found to be at a higher risk, being three times more likely to develop infections. Jennifer Cope MD, the lead author of the CDC study. It is believed that a contributing factor to these bad habits is the accessibility of products on the internet. Often people choose to buy lenses over the internet for convenience but it has been found that these people are less likely to follow good eye care health practices, have regular checks ups and, after time, find themselves wearing lenses that are not even suited to their prescription. Wash and dry your hands before touching contact lenses. Remove your contact lenses before sleeping, showering and swimming. Clean and rinse your contact lenses in disinfecting solution each time you remove your lenses. After each use, clean your lens case with solution and dry it with a clean tissue. Always change the solution, do not add fresh solution to old solution. Replace your contact lens cases every 3 months. Carry a pair of glasses so that your lenses can be removed when discomfort is experienced. If you have been wearing contact lenses for a long time or are thinking of starting to wear contact lenses, stop and think about your options. Buying and maintaining contact lenses throughout a lifetime is more costly than freeing yourself from the maintenance and potential risks associated with the constraints of contact lenses by having vision correction treatment. Why not contact AVC today to see how we can help on 020 7935 7497 or email us on info@advancedvisioncare.co.uk.